Viewed by Ray as the most efficient and reliable of all the fire by friction techniques, the bow drill method is just one of many different skills taught on our Fundamental Bushcraft course. 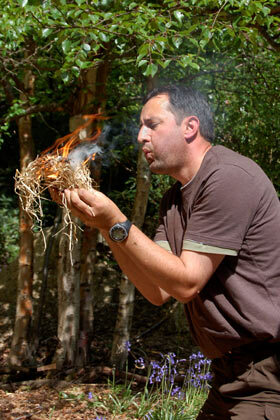 If you’d like to give this method a go, as well as trying your hand at natural shelter construction, wilderness fishing techniques and other outdoor skills, take a look at our Fundamental Bushcraft course. 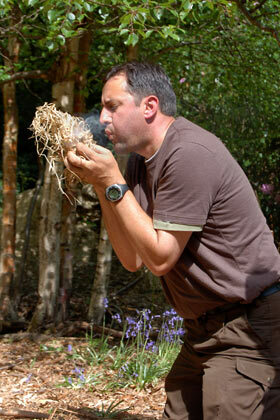 This entry was posted in Bushcraft Courses & Expeditions on June 2, 2010 by Woodlore Team. Thank you for your lovely comments on the photos, I think it was a case of being in the right place at the right time, I know I was really pleased to ‘catch him’ at just the right moment! It is nice to have a photograph, but for those of us that don’t, nothing can take away that feeling, or the memory of how you feel when you first make fire, and I’m sure Richard can vouch for that too! Hopefully I’ll get to meet you on the Camp Craft course in July. Excellent pictures of my hubby in action Colette! Perfect timing and what concentration on his face – such satisfaction in the achievement. Any chance of getting some copies via email? 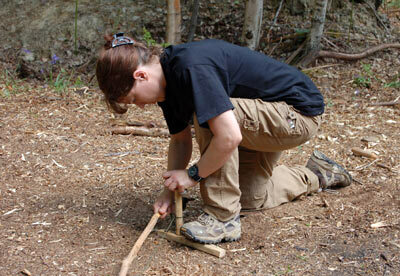 PS Really looking forward to my upcoming campcraft course…my turn to concentrate then! It was a great course with wonderful instructors. Harder than I expected but very rewarding and gives you a real insight into bushcraft and survival. Highly recommended!! !